“Elliot: A Soldier’s Fugue,” the first play in Quiara Alegría Hudes’ trilogy about the moral and psychological distress of a Marine back from duty in Iraq, almost captured the Pulitzer Prize for drama. 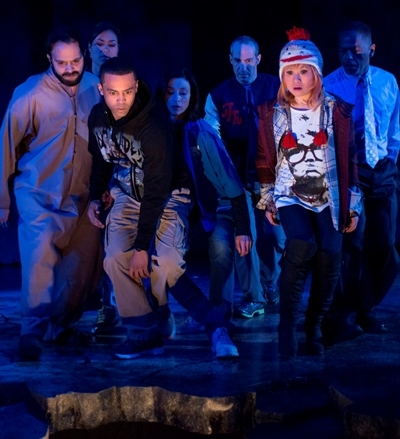 The trilogy’s second installment, “Water by the Spoonful,” won the Pulitzer, and the merits that pushed it over the top are evident in every nuance, impulse, collision and aspiration of the current production at Court Theatre. What is so remarkable and absorbing about “Water by the Spoonful,” deftly directed by Henry Godinez, is a combination of interlaced personal struggles, tightly wound dialogue and assorted characters we both believe in and care about. It is also a play of credible, indeed recognizable components: isolation and the ascendancy of conscience, despair and the triumph of self-discovery. Back home in Philadelphia after duty in Iraq, Elliot Ortiz has reconnected with his cousin Yazmin (the exuberantly appealing Yadira Correa), whose mother became his as well when his birth mother succumbed to the ravages of drug addiction. His real mother, who has stayed clean for several years, now moderates an online chat room for drug abusers trying to quit – some who’ve been in the group long enough to know the difference between truth and pretense and a newbie who’s just a “recreational user.” Buzzz. That’s a lie, and everyone knows it instantly. 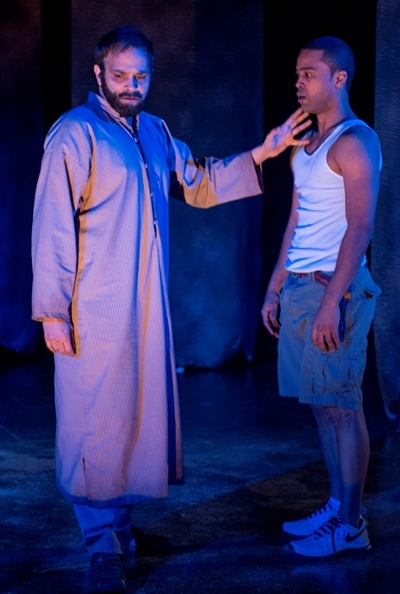 By no means is Hudes’ poetic drama simply a soldier’s tale. Elliot — namesake of the first play and decidedly the focal point of the third, “The Happiest Song Plays Last” (potently rendered last season at the Goodman Theatre) — functions in “Water by the Spoonful” as the thread that draws us through a multilayered fabric of troubled souls who touch on his life, whether directly or through intriguing degrees of separation. Bad karma hounds Elliot, adroitly portrayed in a shifting balance of angst and optimism by Edgar Miguel Sanchez. He suffers from a leg wound sustained in Iraq. He’s haunted by a pale, tunic-garbed specter that ceaselessly moans a phrase in Arabic. And the “mother” who raised him dies, leaving him grief-stricken and raging because his negligent birth mother still lives. For Elliot, the unfairness of it all is disorienting, unfathomable, appalling. Yet the ex-Marine is not alone in his torment. Virtually all of the characters in Hudes’ weave of desperation are peering into the abyss – literally. John Boesche’s spare set design focuses attention on a yawning, rough-edged gap at the front edge of the stage where at one time or another various characters hover at the brink of their fate. In a manner of speaking, “Water by the Spoonful” is about nourishment, spiritual as well as bodily, sustenance patiently meted out with love, understanding and commitment. That’s the essence of the online support group led by Odessa Ortiz, Elliot’s failed birth mother, now several years clean and faithfully striving to help other drug abusers. Charin Alvarez offers a touching performance as a woman barely clinging to life, racked with guilt and quietly seeking redemption. Her online circle is a wonderful lot: Marissa Lichwick as an impetuous, cocky young Japanese American with a foul mouth and a delicious sense of humor; Dexter Zollicoffer as a sharp-witted and plain-spoken middle-aged African American, toiling away at his dead-end office job with the IRS; and Daniel Cantor as the newcomer who’s lying to himself about a habit that’s obvious to the group. Drugs have ruled, ruined or threatened to ruin the lives of all these people. And all of them know it just takes a little push, the pressing of the right button by someone who knows the buttons, to send them reeling into that abyss. They also know the meaning and value of true loving kindness, and so they reach out to each other. 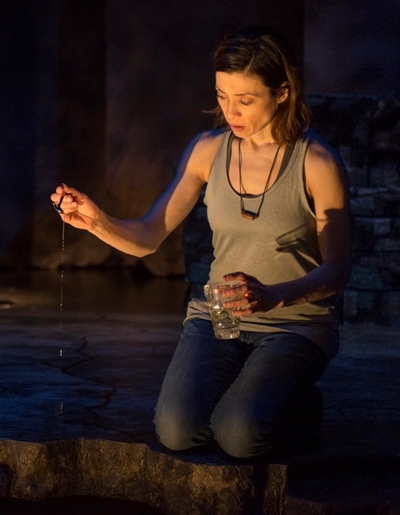 The play’s intertwining strands reach a kind of triple ending: one full of promise, another no closer to closure than in the beginning and the third transformational, transcendent, sublime. It is the third resolution that will long remain in memory – Cantor’s self-absorbed, truth-resistant “occasional” user and Alvarez’s fallen and crushed mom, framed in an image of pietà. Behold the quality of mercy unstrained.